Laura Elizabeth Dern (born February 10, 1967) is an American actress. She is the recipient of numerous accolades, including four Golden Globe Awards and a Primetime Emmy Award, and has been nominated for two Academy Awards. Born to actors Bruce Dern and Diane Ladd, Dern began a full-time acting career in the 1980s with roles in the dramas Foxes (1980) and Mask (1985). She went on to collaborate with David Lynch in several films, including Blue Velvet (1986), Wild at Heart (1990) and Inland Empire (2006), as well as the television revival of Twin Peaks (2017). Dern received a nomination for the Academy Award for Best Actress for playing the titular orphan in Rambling Rose (1991) and won the Golden Globe Award for Best Actress – Miniseries or Television Film for the 1992 film Afterburn. She received international recognition with her role in the adventure film Jurassic Park (1993). In 1997, Dern guest-starred in the "Puppy Episode" of the sitcom Ellen, in which Ellen DeGeneres publicly came out. Following roles in such films as Citizen Ruth (1997), October Sky (1999), and I Am Sam (2001), Dern won the Golden Globe Award for Best Supporting Actress on Television for portraying Katherine Harris in the television film Recount (2008) and the 2012 Golden Globe Award for Best Actress in a Musical or Comedy Series for her role as Amy Jellicoe in the HBO series Enlightened (2011–2013). Dern continued to take on supporting roles in several successful films, including The Master (2012), The Fault in Our Stars (2014), and Star Wars: The Last Jedi (2017); and she received a nomination for the Academy Award for Best Supporting Actress for the biopic Wild (2014). Dern won the Primetime Emmy Award for Outstanding Supporting Actress in a Limited Series or Movie and received another Golden Globe for her role as Renata Klein in the HBO series Big Little Lies (2017–present). Dern was born in Los Angeles, California, the daughter of actors Diane Ladd and Bruce Dern, and great-granddaughter of former Utah governor and Secretary of War, George Dern; Dern was conceived while her parents were filming The Wild Angels. The poet, writer, and Librarian of Congress Archibald MacLeish was her great-great-uncle. After her parents' divorce when she was two years old, Dern was largely brought up by her mother and grandmother. She was raised Roman Catholic. She studied ballet at the age of five, but quit at age ten once she developed scoliosis. Laura Dern's film debut was an appearance in her mother's film White Lightning (1973). She also made a brief appearance in Alice Doesn't Live Here Anymore (1974), one of Ladd's signature roles. Her mother objected to her 13-year-old daughter's presence on the set of Ladies and Gentlemen, The Fabulous Stains, but Dern sued for and received emancipation. However, Laura Dern claims the emancipation was done solely for professional reasons and that both of her parents supported her in this. By being emancipated, she was able to play more adult roles and work longer hours. In 1982, she became the youngest-ever winner of Miss Golden Globe. Dern also auditioned for the iconic character Clarice Starling in The Silence of the Lambs (1991), but lost the role due to studio's skepticism about her bankability. In 1992, she and her mother became the first mother and daughter to be nominated for an Academy Award for acting in the same film in Rambling Rose although, unlike in Wild at Heart, they did not play mother and daughter in the film. Dern starred as Dr. Ellie Sattler in Steven Spielberg's 1993 film Jurassic Park. That same year, Clint Eastwood contacted the actress for his film A Perfect World. She also starred as Ruth in the 1996 film Citizen Ruth, the directorial debut of Alexander Payne. Dern's mother makes a cameo appearance, playing Dern's character's mother, with Dern's character screaming a torrent of abuse at her. Dern in 2009 at a ceremony for Mary Steenburgen to receive a star on the Hollywood Walk of Fame. In 1997, Dern was featured in Widespread Panic's music video for their song, "Aunt Avis", which was directed by Dern's then boyfriend and future fiancé, Billy Bob Thornton. In 1998, Dern co-starred in Jodie Foster's film The Baby Dance. While dating Thornton in 1999, she was cast as his love interest in his film Daddy and Them, which also includes Diane Ladd. Dern also appeared in Joe Johnston's film October Sky. Robert Altman called upon Dern's talents to play a Champagne-loving Aunt in his Texas-based comedy Dr. T & the Women in 2000. She co-starred in Within These Walls and Arthur Miller's Focus. She had a minor role in Jurassic Park III, and was a supporting actress in the film I Am Sam. She starred in the 2002 film Damaged Care and the 2004 film We Don't Live Here Anymore. Dern starred in the 2005 film Happy Endings, and in the same year, she appeared in the film The Prize Winner of Defiance, Ohio. In 2006, David Lynch and Dern reunited for Inland Empire and, also in 2006, Dern had a supporting role in Lonely Hearts. Mike White, known for writing School of Rock and The Good Girl, hired Dern for his directorial debut in 2007, the comedy titled Year of the Dog and starring Molly Shannon, John C. Reilly, and Peter Sarsgaard. In 2008 Dern starred in Recount for which she won a Golden Globe Award for Best Supporting Actress - Series, Miniseries or Television Film. Since then, Dern was seen in the independent 2009 drama Tenderness and, in 2010, she appeared in Little Fockers, playing an advanced school principal who dated Owen Wilson's character Kevin Rawley. Dern has done much work on television, most notably Afterburn, for which she received a Golden Globe Award for Best Actress in a Mini-Series or Movie. She guest-starred on The West Wing, was a voice on King of the Hill, and was a lesbian who coaxes Ellen DeGeneres out of the closet in the famous 1997 "The Puppy Episode" of the television series Ellen. On the April 24, 2007, airing of DeGeneres's talk show, Dern revealed she did not work for more than a year following her appearance in that episode because of resulting backlash, but nevertheless called it an "extraordinary experience and opportunity." Dern has been acknowledged with several awards from the independent film industry including the Sundance Institute and was the subject of an aggressive media campaign by David Lynch to earn her an Academy Award nomination for her work in Inland Empire. On November 1, 2010, she received the 2,420th star on the Hollywood Walk of Fame. Her parents, Diane Ladd and Bruce Dern, were also presented with stars. Dern appeared in Paul Thomas Anderson's 2012 film The Master, along with Amy Adams and Philip Seymour Hoffman. Dern appeared in Jean-Marc Vallée's 2014 film Wild alongside Reese Witherspoon, for which she received an Academy Award for Best Supporting Actress nomination. In 2017, Dern reteamed with both Witherspoon and Vallée for the 2017 HBO miniseries Big Little Lies, winning her first Primetime Emmy Award for Outstanding Supporting Actress in a Limited Series or Movie for her portrayal of Renata Klein. That year, Dern also appeared in David Lynch's revival of Twin Peaks for Showtime as Diane Evans and in Rian Johnson's blockbuster Star Wars: The Last Jedi as Vice Admiral Amilyn Holdo. In 2018, Dern had the lead role in The Tale, an autobiographical feature film written and directed by Jennifer Fox. The film premiered at the 2018 Sundance Film Festival on January 20, 2018 and later on HBO on May 26, 2018. In August 2018, Dern was cast as Marmee March in Greta Gerwig's film adaptation of Little Women which will star Saoirse Ronan, Emma Watson, Timothée Chalamet, Meryl Streep, and Chris Cooper. Dern is an activist and supporter of various charities, such as Healthy Child Healthy World, which aims to raise awareness about toxic substances that can affect a child's health. She advocated for Down syndrome awareness in a cover story for Ability Magazine. During the 66th Golden Globe Awards, on January 11, 2009, Dern expressed support for the incoming administration of Barack Obama during her acceptance speech for the Golden Globe Award for Best Supporting Actress – Series, Miniseries or Television Film for her work on the film Recount. She is quoted as saying, "I will cherish this as a reminder of the extraordinary, incredible outpouring of people who demanded their voice be heard in this last election so we can look forward to amazing change in this country. Thank you so much!" In 2018, she brought activist Mónica Ramírez to the 75th Golden Globe Awards as a guest. Dern began dating musician Ben Harper after they met at one of his concerts in fall 2000. Harper and Dern married on December 23, 2005, at their home in Los Angeles. They have two children together, son Ellery Walker (born August 21, 2001) and daughter Jaya (born November 28, 2004). Through this marriage, Dern also became a stepmother to Harper's children from his first marriage, his son Charles and daughter Harris. In October 2010, Harper filed for divorce from Dern, citing irreconcilable differences. They briefly reconciled and attended the 2012 Golden Globe Awards together, but Dern reactivated the divorce by filing a legal response in July 2012. The divorce was finalized in September 2013. Dern has also had romances with Kyle MacLachlan, Nicolas Cage, Baron Davis, Renny Harlin, Jeff Goldblum, and Billy Bob Thornton. On October 18, 2017, in the wake of the Harvey Weinstein sexual abuse scandal, Dern appeared on the Ellen DeGeneres Show and revealed that she had been sexually assaulted at age 14. 1989 Nightmare Classics Rebecca Episode: "The Strange Case of Dr. Jekyll and Mr. Hyde"
1993 Fallen Angels Annie Ainsley Episode: "Murder, Obliquely"
1998 The Larry Sanders Show Herself Episode: "I Buried Sid"
The West Wing US Poet Laureate Tabatha Fortis Episode: "The U.S. Poet Laureate"
Drunk History Nellie Bly Episode: "New York City"
2015 The Mindy Project Dr. Ludmilla Trapeznikov Episode: "Best Man"
2017 The Last Man on Earth Catherine Episode: "Got Milk?" Unbreakable Kimmy Schmidt Wendy Hebert Episode: "Kimmy Can't Help You!" ^ a b Harrington, Richard (September 14, 2007). "The Essential Roger Corman". The Washington Post. Washington DC: WPC. ISSN 0190-8286. Retrieved March 12, 2016. Dern's real-life wife, Diane Ladd, playing the Loser's wife, became pregnant with daughter-actress Laura Dern during shooting. ^ "Showtime movie a family affair". Spartanburg Herald Journal. January 28, 1996. Retrieved March 12, 2016. ^ "MFA celebrates the films of Laura Dern". The Boston Globe. December 23, 2016. Retrieved June 22, 2017. ^ McHenry, Jackson (December 23, 2016). "It Sure Looks Like Laura Dern's Going to Have a Big Part in the Twin Peaks Revival". Vulture.com. Retrieved June 22, 2017. ^ a b Dern, Laura (October 7, 2013). "Laura Dern Interview". WTF Podcast (Interview). Interviewed by Marc Maron. ^ "Movie Reviews, Articles, Trailers, and more at Metacritic". Movietome.com. Archived from the original on March 28, 2008. Retrieved January 21, 2012. ^ Associated Press (April 23, 2007). "Ellen and Laura Dern reunite after kiss". Retrieved November 20, 2008. ^ "Enlightened: Homepage". HBO. Retrieved January 21, 2012. ^ "HBO's 'Enlightened' Take On Modern Meditation", Fresh Air interview with Dern and White on NPR, October 10, 2011. Retrieved October 10, 2011. ^ "Laura Dern, Amy Adams and Others Join P.T. Anderson's 'The Master'". FirstShowing.net. June 1, 2011. Retrieved January 21, 2012. ^ "Star Wars Episode VIII now filming". ^ "Laura Dern in Talks to Join Meryl Streep in 'Little Women' (Exclusive)". The Hollywood Reporter. Retrieved August 26, 2018. ^ "Laura Dern interview with Chet Cooper". Abilitymagazine.com. Retrieved August 31, 2016. ^ "Laura Dern Goes Political at the Golden Globes". YouTube. Retrieved January 11, 2009. ^ a b c d Miller, Samantha (February 4, 2002). "Dern Happy". People. Retrieved September 21, 2013. ^ Fisher, Luchina (October 18, 2017). "Laura Dern recalls being sexually assaulted at age 14". ABC News. Retrieved February 23, 2018. 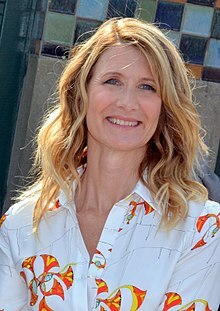 Wikimedia Commons has media related to Laura Dern.